Mere words could never do this match justice. Particularly when you consider that this match was won with pure heart. Well and some luck. And young talent. Honestly, I don’t even know how this match was won. Juve were the better team. They played better. They had an incredible goal disallowed. And Allegri is still there. Oh, wait, that might explain part of it. But seriously, does any of that matter? We won. We beat Juve. And those precious three points that we miraculously stole from them put us in second for now, only two points behind Juve. The only word that could possibly describe how I feel is elation. Coming into the match with a bizarre form made up of a lot of luck and some manic emotions surrounding our young phenoms, even a draw with Juve still seemed too much to ask. And right away, it seemed like that would be incredibly lucky. Juventus came out completely dominating possession, with 59% possession in all. They also attacked relentlessly, with 22 shots in all, only three on target, and so it seemed right away that we would concede. Dybala certainly tried. He saw Donnarumma off of his line and shot from distance, but not only did he not make it, he injured his thigh. He was unfortunately subbed off in the 33rd, yet another muscle injury on Allegri’s watch. Get well soon, kid. Then came the controversy of the night. In the 36th, Pjanic took a free kick. It went in. And for like a minute or so, that goal stood. 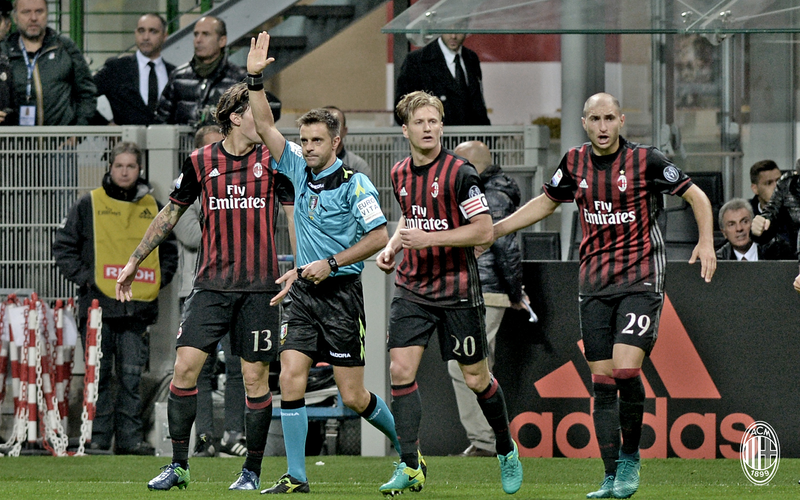 Milan players swarmed the ref… again. And Rizzoli consulted his assistants and called the goal back. Some people were claiming it was an indirect free kick, and thus called back since he had scored directly. But replays show that the ref was not signaling an indirect free kick, and Rizzoli would have called it off immediately if that was the case. The call was offside, and it was a tight call. It could have gone either way. But it went Milan’s way this time. Not Muntari’s way, although ironically, he was at the stadium. But that was a totally different call in a game a long time ago, and it disgusts me that Milan fans cling to a single ref call like that all these years later. Even more disgusting that they trolled Juve fans after the game. It used to be that Milan fans were better than that. And why is no one talking about the biggest crime? Pjanic’s free kick was exquisite. 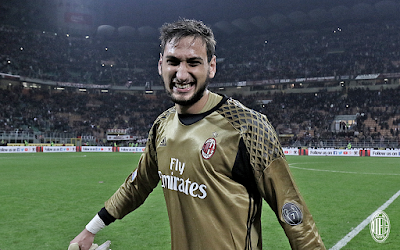 Over the wall, coming down perfectly to bounce just out of Donnarumma’s reach. It should have stood for the beauty alone. Poor Pjanic got a yellow for complaining about it, but I would have probably done the same, quite honestly. It was beautiful. Going into the half, it was miraculously still 0-0. To demonstrate the kind of unity in the team right now, in the 56th, Donnarumma used Abate as a staircase to climb up and reach the ball. Ouch. Then Niang took a knock to his ankle in the 63rd, an injury so serious that six minutes later, Montella felt the need to sub him off for Poli. I am really worried. There are very few reasons in this world that a coach would need to do something so extreme as bring on Poli. Hope Niang is okay. But I think that sub was actually a moment of insanity, because in between the injury and the sub was the moment of truth: Locatelli’s goal. In the 65th, Locatelli shot another rocket past Buffon and the San Siro just erupted with joy. 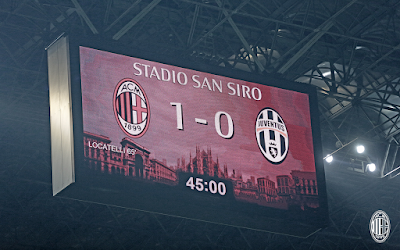 1-0 Milan. No one could find a reason to call it back. Not that anyone would have known if it was, there was so much crying and screaming and hugging (and I was watching this one by myself.) This kid, only 18 years old, who was supposed to get his debut the last time we faced Juve in the league, but was snubbed by our injured captain, who refused to come off. 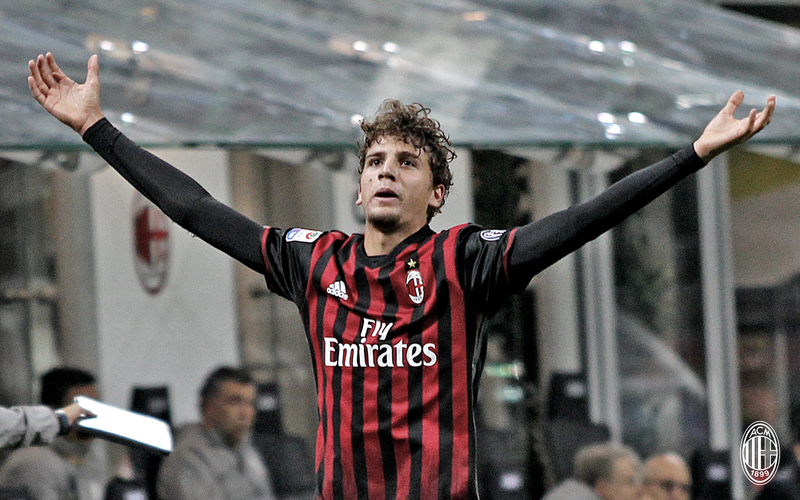 The same kid who finally was subbed on for our captain in his last Milan game before the injury, and came on and scored the winner in that game, too. Say what you will about Karma, but this kid has gotten us six points in just two of our games. I don’t remember our captain doing any such thing recently, if ever. So Juve still fought, and the yellow cards stacked up for both sides (seven total.) But I think some of the wind was knocked out of them with that disallowed goal, it’s a shame. Because it would have been better to defeat them without the controversy. In the 84th, in one of the many Juve efforts to score, Donnarumma took a nasty kick to the head from Pjanic. Scariest moments of the match. But in addition to being other-wordly in talent, the kid is apparently also indestructible. Massive points to him for grabbing the ball in that kind of traffic, and even more for getting back up. Especially since, amongst his many saves, the most spectacular came in the last second of the match, where he jumped, stretched, arched backwards, and saved the game all in an instant on poor Khedira’s final shot. Unfreakingbelievable. He’s 17. I don’t even want to say what I was doing at 17, it was pathetic. We didn’t play well. Montella’s subs were as questionable as ever. His “possession-based football” is as laughable as ever, we can’t hold the ball to save our lives, let alone create more than eight chances against a team like Juve. But what we did have tonight was grinta. Massive, massive, unbelievable quantities of heart, belief, and determination. And despite the controversy, for the grinta alone, I believe we did deserve to win. We have two unspeakably talented teenagers who literally won the game for us. Again. And we have nine other players who made some contributions, too. But the spirit to go out there against the first place team and be pummeled by attack after attack, but still try… that was purely magical. I guess it wouldn’t be Milan if the Curva didn’t try too hard, though. I was very, very disappointed in their coreo, not just the fact that it was so self-serving, but that they said “Yesterday, today, tomorrow… we’ll always be here.” Really? Because I can think of a number of games just last season that they boycotted and were very pointedly not there. So it really should read “we’ll always be here… in good times.” Then they held up a banner saying “Montolivo we are with you.” Really? Just a few weeks ago, you wanted him out. Or dead. Or something. And also pretty much all of last season, and maybe before that, too. Disgusting. So then they held up a banner for little Matteo, Bonucci’s two year-old son, who has been having some serious health problems. That was really classy. But after the other banners, did they even mean it? If Bonucci had scored a controversial goal to win the game, would they have still held it up? Or was it only in good times? Whatever. I miss the days when Milan fans were known for being classy. But classless fans aside, the win was brilliant. A shame about the controversy, because it would be nice if there were no question marks. But three points and second place in the table (for now,) two points behind Juventus does not come with question marks. History will show that we beat Juve. Finally. After like five years. Five years not only of not beating Juve, but of so much crisis and pain. It’s so sweet, it’s hard to even notice the bitter. And I know I am certainly still floating on air. 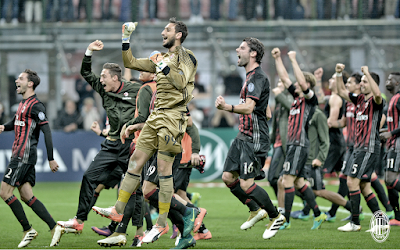 Millions of Milan fans gave their fingernails, their livers, their hearts, and much more to this match, it was so intense. But in the end, we were richly rewarded with a sense of pure elation.